This isn’t to say that Anatomy is a play-by-play of an event with a catalogue of possible outcomes. PE︱mo’s intention is less to be didactic about reversing racism and finding healing, than to create a nuanced and layered journey for the viewer. Part of those layers are that each performer (there are six) has a character with a backstory, but it’s not necessary that the audience know specifically what that story is. “It’s important to us that there’s an inner logic to the character’s behavior,” says Vissers. At the same time, both artists are drawn to abstraction, and the show incorporates text, theater, and dance to investigate its themes. Vissers furnishes the choreography while Hatlo supplies the stage direction and dramaturgy. “The way into this work for both of us is so different,” notes Vissers. “With that comes a lot of trust of each other’s process, being so different and knowing that we often agree but we’re talking in a very different language.” Since they are rooted in different disciplines (Hatlo in theater and Vissers in dance), they’ve developed their own methods to merge their practices into a final piece. It can work in different ways. Vissers builds the choreography and then Hatlo adds a layer of depth or meaning to it. Hatlo crafts a narrative structure with a rough movement idea and then Vissers clarifies the movement with the performer while maintaining Hatlo’s intention behind it. This kind of tag-teaming takes extensive communication and the two meet almost as often as they rehearse with the cast. Hatlo says the process has gotten easier over the years as their trust has deepened. They’ve also learned when not to interrupt each other when one is in the flow of creating, how to communicate their ideas to each other, and how to effectively communicate those ideas to the cast. Both directors face unique challenges as well. 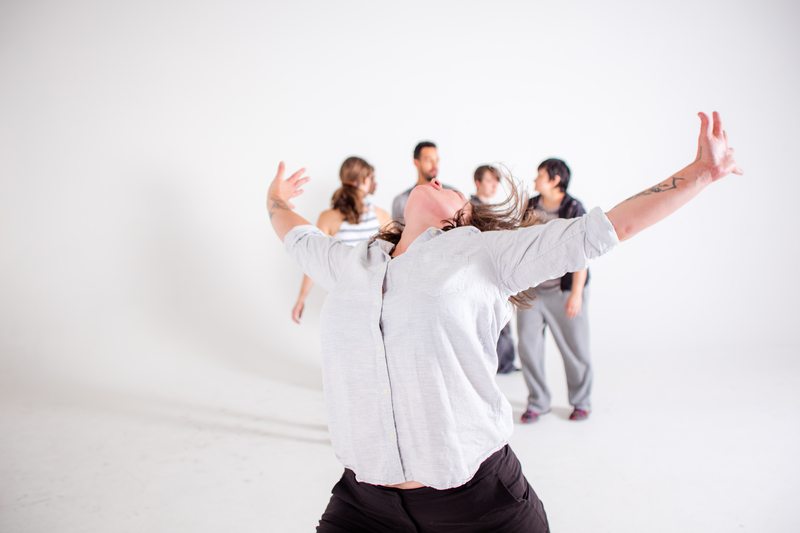 Vissers creates movement on people with varying degrees of dance experience (the cast includes three formally trained dancers), while Hatlo asks dancers to perform text as nuanced characters. The level of commitment and generosity they have from the cast is both formidable and tangible. “There have been moments where I’ve just felt so well supported by them,” says Hatlo. “There are moments when we’re not agreeing, and they just let us hash things out. They’re people who trust that we’ll get there.” That trust is a testament to the environment the co-directors create in rehearsal. Both have stressful jobs themselves, so they acknowledge that the performers also have things outside of rehearsal that take up space in their lives. This acknowledgement is reciprocated by the trust they receive from the cast. Though Anatomy deals with weighty issues of race, class, and traumatic events, its abstraction lends itself to distinct moments of beauty and tenderness: a lush and interwoven dance phrase or something as simple as a performer gently resting their head on another’s shoulder. When asked what they hope the audience will walk away from the piece with, Vissers replied that, “If the audience feels like they were taken from one place to a very different place—like they travelled with the performers in some way—that would be good. I hope that people are affected by it, that it’s not just ‘I’m sitting back here and this performance is happening in front of me.’” The structure of the performance supports how Vissers would like the audience to engage. Since the piece changes orientation several times and the audience will move through the space, it will be difficult to watch too passively. Accessibility was also an important issue for PE︱mo, and so they’ve made tickets available on a sliding payment scale. There are only thirty seats a night, however, so be sure to reserve your spot before it fills up. Go to see excellent performers in richly complex roles, or go to see moving dance theater, or go to experience what new possibilities PE︱mo’s world opens up. Whatever the reasons, it will surely be worth the journey. Anatomy of An Accident runs November 6-15 at Open Flight Studio. For tickets, see HERE. For more information on PE︱mo see the company’s website.